Sonoma County, or Sonoma as it is regularly referred to on the wine boards, is a very large area spread over nearly 1,800 sq/mi and incorporating 16 different AVAs. Elevations from sea level to almost 2,700' make it an area of multiple hills, valleys, pastures and micro-climates. So many threads pop up here asking where to go and/or where to stay when visiting Sonoma. Being a local I want to scream "Be more specific!" Sonoma is a town but is also the name of the County. To me Sonoma is the town of. To the traveler it is the wine region. Giving you the proper advice hinges on multiple factors. Here are a few things to consider when asking for advice from Berserkers. Some AVAs are spread apart to where visiting more than one or two in a day is not a good choice so be aware of the location of your winery choices before mapping out your tastings. Bennett Valley - Extends Southeast from East Santa Rosa. Carneros-Sonoma - Nestled between the Southern edge of Napa and the Southern edge of Sonoma along San Pablo Bay. Chalk Hill - Stretches from the southeast of Windsor (Pleasant Ave) north to Hwy 128 in the Alexander Valley. Green Valley of Russian River Valley - A small area within the RRV to the West of Hwy 116 and the East of the Occidental Ridge, North of occidental Rd up to Forestville and the Russian River. Moon Mountain - on the West facing slope of the Mayacamas overlooking Sonoma. Northern Sonoma - This AVA encompasses everything that isn't within the Sonoma Coast and Sonoma Valley area but has a small piece that holds the name Northern Sonoma and that is in between the Dry Creek Valley and Sonoma Coast AVAs along Skaggs Springs Rd through Annapolis. Russian River Valley - Central-most to the County this AVA stretches from Rohnert Park in the South to Healdsburg in the North. This AVA alone and its' 100+ wineries could be the focus of an entire week. Sonoma Coast - Runs the length of the County from San Pablo Bay to past Fort Bragg in the North containing the Petaluma Gap, Occidental, Freestone, Bodega, Jenner, Sea Ranch, Cazadero and more. Sonoma Mountain - Approximately 10 miles of ridgeline beginning at the southern tip of Bennet Valley and stretching South. Sonoma Valley - Along Hwy 12 from Pythian Rd (Oakmont Retirement Community) to Carneros in Sonoma. Encompassing Kenwood, Glen Ellen, Agua Caliente, Boyes Hot Springs, El Verano and Sonoma proper. It would make sense to set up camp close to where you are planning to visit, taste, eat for convenience sake as well as for punctuality because traffic can be unpredictable. Tasting in Carneros, Sonoma Valley, Sonoma Mountain, Moon Mountain AVAs? You probably should be staying in either Sonoma, Glen Ellen or Kenwood. Bennet Valley, Russian River Valley, Green Valley, Sonoma Coast locations are begging you to stay in or around the Santa Rosa area. This includes Sebastopol, Forestville, Occidental, Guerneville to the West in order to make your plans flow easily. Chalk Hill, Dry Creek, Rockpile, Alexander Valley, Knights Valley, Pine Mountain wineries say Healdsburg/Geyserville/Windsor are your best lodging choice. Knights Valley is a tough one as it is closer to Calistoga than anywhere else but then again there aren't a lot of wineries there, just vineyards. It may make sense to spilt your stay between different locations to accommodate your plans. Or, if you like driving, choose one central location and travel out from there. Just keep in mind that if you are staying in Sonoma and you want to have dinner in Healdsburg you have a drive of over an hour, much of it on winding 2 lane roads, to get back to your room. Are you traveling with Children? Or is it an Adult Only affair? Some accommodations/wineries/restaurants are not as kid friendly as others. This may factor in you plans in a big way. Knowing this information up front ensures you get better advice. Also, knowing you have children along for the ride means you may need some non-wine related activities as well. Lots of this around here from Canoe Trips on the Russian River, to the Charles Shulz Museum/Snoopy's Redwood Ice Arena, to Safari West Wild Game Preserve, to Sonoma Canopy Tours Zip-Lining, Coppola has lounge chairs around a pool where you can swim and enjoy the sun etc... Be specific! Not everyone can afford Madrona Manor, The Farmhouse Inn, Dry Creek Kitchen, $1,000/btl wine lists, $75+/btl wineries. Some might want to cut back on the hotel to be able to afford more/better wines. Others may just be looking for the overall experience. Knowing your price range plays a big role. The weather is generally mild most of the year, compared to other parts of the country, but temperatures can vary drastically from one AVA to the next. More so in the Summer/Fall months. Winters are rainy but otherwise sunny. Spring brings warmer days but cool evenings. As soon as the sun dips the temps drop 20 degrees. Don't get caught with your pants down. Summers are normally warm and sunny with morning fog that burns off between 9-11am depending on location. If you wake up early and see blue skies and no sign of fog or any overcast be prepared for a hot day. Afternoon temps range from high 70's to high 90's with occasional 100+ spurts. The afternoons bring breezes caused by the coastal fog influence. They blow between 4pm and 6pm. Once the temps stabilize the wind goes away and the evenings are mild and pleasant. Fall is one of the best times of year as the days are warm and the evenings stay beautiful. Best times for night time outdoor activities is Aug-Oct. The rainy season is Halloween through May. Between Memorial Day and Labor Day rain is rare. The hillsides dry up and everything other than trees and irrigated farms and landscaping turns brown. Fire danger is very real. Keep cigarette butts in ash trays not out windows. Roadside fires in Summer months are very common. Be prepared for hot to cool weather. If you are leaving your hotel in shorts bring a pair of long pants and a sweater just in case. Vice-versa if you are leaving in sweaters and long pants bring shorts, t-shirt and flip flops. You can leave 90 degree weather in Healdsburg and find high 60's and blowing fog in the Petaluma Gap. 80 in Sonoma, 90 in Kenwood, 75 in Santa Rosa 85 in Forestville and 65 in Jenner/Bodega Bay all in the same 1-1/2hour drive. Best to be prepared, especially if you are driving a convertable. This started out as "Recommended Wineries" but what do I know, everyone has different tastes, not everyone is as geeky about this as the next. It's not up to me to decide who should or should not be listed here so I am listing every winery I am aware of. You can choose yours based on your preferences. Please note that many producers use Custom Crush Facilities such as Punch Down Cellars, Vinify etc... So where they are based may differ from where their fruit comes from or where their tasting will take place. Shore those details up with the winery beforehand. Disclaimer: I crossed the County Line with my Carneros listings but Carneros is Carneros. Part of it is in Sonoma and another part in Napa. VISA Signature also sponsors the "Taste of Sonoma" aka "Wine Country Weekend" held in September every year. The biggest annual food and wine event in Sonoma County. The grand tasting at MacMurray Ranch in Healdsburg is a massive event. Click on the "Spoiler" under each heading to expand. - At the present time there are just three active bonded wineries in the appellation. Matanzas Creek Winery, set at the heart of the Valley, is the only one with a tasting room open daily. The other small, quality focused Bennett Valley wineries; Flanagan Family Vineyards and Sable Ridge Winery are open to visitors by appointment only. More recently, several Bennett Valley growers have been impressed enough with the valley’s unique terroir and distinctive fruit to begin producing wine under their own labels. For the most part, these recently established brands produce small lots of ultra premium wine in artisan production facilities located outside of the Valley. They are likewise open to visitors by appointment only. There are no wineries within the Rockpile AVA but the following labels use its' fruit. - Fogline Vineyards - M-Th by appt. F-Su 11am-4pm CY, PN, SY, ZN River Rd across from Old World Winery JWO PG&E Substation. - Salinia Wine Company - By appt CY, PN, SY Same facility as The NPA, can do two tastings at once. Knowing when these events are taking place can help you plan out your trip to coincide with them or, in some cases, to avoid the crowds. Not a complete listing but some of the more popular events. - Sonoma Valley Olive Festival - Put some sparkle in your spirit with a visit to Sonoma Valley this winter season. In January and February, our annual Olive Season lights up the Valley with a two-month-long celebration as we toast all things olive. - Pigs and Pinot - Hotel Healdsburg. The celebratory weekend offers a series of intimate dining and educational events hosted by Chef Palmer. A cast of Master Sommeliers and international celebrity chefs will showcase some of the world’s greatest Pinots Noirs with perfect pork pairings. - Pinot Family Reunion - Featuring over 40 wineries participating in a wine and food tasting at Vintners Inn Event Center, followed by a family-style dinner paired with some of the area’s top pinot producers at John Ash & Co. restaurant. Proceeds benefit the Sutter North Bay Women’s Health Center. - Passport to Dry Creek Valley - More than 50 Wineries located throughout the pristine and unspoiled beauty of Dry Creek Valley. - Historic Vineyard Society Tour and Dinner - An all day event where you tour 4 or more historic old vine plantings, in small groups, hosted by the vineyard managers/growers/winemakers. This is followed by a dinner featuring wines from the vineyards visited among others. Learn history, farming practices and get up close and personal with your hosts. - The Seven % Solution - Roughly 93% of Northern California Vineyard acreage is planted to eight major grape varietals.The remaining 7% acreage is home to numerous lesser known varietals. These 'seven percent' varietals are finding anchor with a small but growing number of winemakers. This tasting is a showcase of twenty or more wineries and their seven percent solutions. - Monte Rio Variety Show - A benefit for the Monte Rio Fire Dept and St Catherine of Sienna Church. After their 2 week Summer Encampment the members of The Bohemian Club put on this show of Music, Comedy, Poetry, Magic and more accompanied by a Chicken and Rib BBQ, Beer and Wine. Grammy winning singers, song writers, musicians... You never know who might perform. Steve Miller, Kix Brooks, Phil Vassar, Zac Brown, Shelley Berg, Gary Muledeer perform under the stars at the Monte Rio Ampetheater. 2019 will mark the 108th year. Advance ticket purchase and seat placement a must. If you’re in the Russuan River area in July and are looking for something different to do for an evening this is the perfect fit. - West of West - A full weekend featuring West Sonoma County cool-climate producers and artisan foods. Seminars, winemaker dinnners, grand tastings. - Gay WineWeekend - A weekend of wine & celebration in California Wine Country - Featuring TWILIGHT T Dance & Gay Wine Auction benefiting Face to Face, Sonoma County AIDS Network. - Pinot on the River - 100+ Wineries, seminars, grand tasting in downtown Healdsburg. - Sonoma County Harvest Fair - Sonoma County Harvest Fair is a celebration of the local harvest featuring three full days of all-inclusive wine tasting with 150+ wineries, wine sales, food pairing, craft beer & cider tasting, marketplace, chef demonstrations and workshops, the World Championship Grape Stomp and much more. - Santa Rosa Original Certified Farmers Market - @ Wells Fargo Center for the Arts, Mark West Springs Rd @ US-101 Year round Wednesday: 8:30 A.M. to 12:00 Noon, Saturday: 8:30 A.M. to 1:00 P.M.
- Sonoma Tuesday Night Farmers Market – throw-out a picnic blanket and hang with the locals. It is legal to drink in the park, so bring a bottle or two to share. Fair-type food vendors are present or bring your own bites. Very kid friendly. Runs from first Tuesday in May through the last Tuesday in October. You Gotta Eat Somewhere Under Construction! - Bay View Restaurant - @ Inn at the Tides. Italian and fresh seafood. - The Duck Club Restaurant @ Bodega Bay Lodge. American focused seafood, fowl, meat dishes. Upscale. - The Tides Wharf Restaurant - Right on the water. More tourist focused. Traditional seafood dishes. How does such a postage stamp of a town have so many good places to eat? It's our little slice if Heaven in West County. - Corks Restaurant - @ Russian River Vineyards. The only Winery/Restaurant combo in West County. Best outdoor dining location! - Twist Eatery - Tuesday-Sat 11-4 Great upscale lunch menu. Beer and wine too! - Garden Court Café - Wonderful breakfast. - Glen Ellen Inn Restaurant - Oyster Grill & Martini Bar, "Martini list as long as your arm!" - Garden Grill - Just west as you leave town. Great eats! - Barndiva - Farm to table, great small plates, very good wine list. - Healdsburg Bar and Grill - Douglas Keane inspired fare, casual indoor/outdoor. Good lunch spot. - Healdsburger - Lots of meat choices. Good shakes and fries. - Healdsburg SHED - Eat, Shop, Gather, Learn. Wonderfully relaxed atmosphere, farm fresh ingredients. - SingleThread Farms - The newest must visit spot in H'brg. Advance reservations/ticlets required. - Café Citti - Italian Trattoria, order at the counter, dine at the table. Limited wine choices, Pliny the Elder on tap! - Lonchera Emily Taco Truck Hwy 12 @ Dunbar (Pagani Ranch) Kenwood - Great Al Pastor among other meats. - Cowgirl Creamery - Wed-Sun 10-6 Cheese, cheese, cheese! - Hog Island Oyster Co - They don't get any fresher than this. Reserve a picnic table, bring some briquets and grill some fresh oysters while you enjoy a great wine! - Howard Station Café - Best Breakfast in the County! - Ike's Place - Best Sandwiches in the County! - Stark's Steakhouse - The name says it all. - Walter Hansel Bistro & Wine Bar - New hot spot in the old Zazu roadhouse location. Wine Country French Cuisine, wine list loaded with great wines at or near release prices. - Hopmonk Tavern - Pliny on tap! Good food, live music on weekends. - Peter Lowell's Restaurant - Get your hippie on. All organic, all good! - Screaming Mimi's - Homemade All Natural Ice Cream, a long time Sebastopol favorite. - Slice of Life - What's an Old Hippy Town without vegetarian food? - Sushi Hanna - Because everyone needs some raw fish and seaweed in their diet, and because it's good! - Viva Mexicana - Traditional and FooFoo Mexican. Something for everyone. - Burgers and Vine – Just opened so still working out the kinks, however all signs point toward a more tourist and party crowd focus. Not a bad spot for a beer before or after dinner. - The Girl and the Fig - Country food with a French passion– usually tough to get a reservation within 48 hours of seating, but one of the few restaurants on the Square open late with a limited bistro menu. Cocktails are very good, Pliny the Elder on tap, Only Rhone-styled wines on the list. The best burger in town. - Harvest Moon Café – seems to be rarely talked about, but always good – surprisingly good, actually. A somewhat stiff corkage policy though. - LaSalette – Portuguese/Mediterranean inspired fair – a fairly ‘exotic’ dining choice for Sonoma Square, with menu items like whole sardines baked in the wood fired oven, escargot, etc. The fish cakes are a huge favorite when available, and the anchovies are some of the best I have ever had. The wine list offers some fun Portuguese whites that are a great budget alternative to the typical Cali Sav Blanc or Chardonnay. - OSO Sonoma - Small plates and raw bar. Small but exciting local wine list. - El Brinquito – they do BBQ chicken out front of the market on Wed/Friday/Sat/Sunday, corner of Hwy 12 and Mountain Ave. Follow your nose – it smells as good as it tastes and is cheap. This is strictly to-go. - El Molino Central - Mexican street food, primarily from the Oaxaca region of Mexico. Very good but not cheap. Simple, patio seating - can be very busy with a long wait during dinner hours. Blue Bottle Coffee also served. - Hopmonk Tavern – Sister of the Sebastopol locatio. Upscale pub food, Pliny the Elder on tap. A favorite with locals, great patio seating in the summer. - Hot Box Grill – Upscale comfort food, known for the duck fat fries and fried chicken plate. - La Bamba Taco Truck – usually in the auto body shop parking lot directly across the street from the Sonoma Mission Inn - usually after 7pm. This is the most popular truck in town for good reason. The wait can be long. The perfect late night snack after a long day of tasting. - Rancho Viejo - authentic Mexican from the Yucatan peninsula. Don’t let the proximity to McDonalds scare you (next door), the cochinita pibil is awesome. - Chinois Asian Bistro - Elegant Asian Fusion, nice wine list. - Himalayan Restaurant "Kaboda and Curry House" Get your Tandoori on! - Omelette Express - The name says it all. Breakfast specialties. - Patterson's Irish Pub - Pub Fare with lots of suds on tap. Indoor outdoor seating. - Sonoma Enoteca - A part of Della Santina's. Buy the wine at Enoteca and corkage is free at DS. Brutocao Cellars, Il Cuore, Dreyer Sonoma, Favero Vineyards, Manzanita Creek, Seabiscuit Ranch, Seabiscuit Ranch, Victor Hill Wines featured. Much more available for purchase. - Hopmonk Tavern - House brews, local ales and sours on tap and over 100 different bottled beers. - Spirit Works Distillery at "The Barlow"
- Woodfour Brewing Company - at "The Barlow"
- Case Ranch Inn - Quaint 3br main house plus a guest cottage nestled in the hills of Forestville. - Applewood Inn & Spa - They call themselves a B&B which is a a stretch. Mediterranean villa styled resort. Great restaurant. - Sonoma Orchid Inn B&B - next door to Korbel on River Rd "Great breakfasts, friendly and helpful hosts, each room different and varying in price. Some cabins for more privacy, and other rooms in an older house." - 1br Cottage Amongst the Vines - Vineyard and lakeside 1br retreat for less than a hotel room! - Honor Mansion - Pricey and a bit overly precious, but good breakfasts, helpful staff (for getting reservations, etc), and beautiful grounds (bocce court, outdoor massage, etc). - Raford Inn - Great setting, wonderful proprietors, centrally located in RRV. Headlsburg address but it's a home run swing away from Forestville. - Wineberry Lodge (Rental Home) - Next door to Merry Edwards Winery - Great for large groups. - Fairmont Sonoma Mission Inn and Spa - Not for the light billfold. Everything you ever wanted to know about the Peanuts and much more! Green Music Center at Sonoma State University - Weill Hall is a World Class music venue. Year round performances of Symphony, Jazz, all forms of popular music, Shakespeare etc... Indoor and outdoor events. Transcendence Theater Company, Broadway Under the Stars - Transcendence Theatre’s Broadway Under the Stars in Jack London State Park is an award-winning series of Broadway-inspired concerts that feature incredible talent from the NY and Hollywood stages and screen. More than just a standard musical review, each concert weaves your favorite Broadway and popular songs into a spectacular evening unlike anything you’ve seen before. Gambling Sometimes buying wine is a gamble, non? Redwood Empire Ice Arena "Snoopy's Home Ice"
Annadel State Park - Miles and miles of paved and unpaved hiking, biking, mountain biking trails through the oak studded hills of East Santa Rosa. California Carnivores - Vegetarians Beware! These plants bite back. This Sebastopol garden features the largest collection of Carnivorous Plants in the US. Luther Burbank Home and Gardens - "I firmly believe, from what I have seen, that this is the chosen spot for all this Earthas far as Nature is concerned." ~ Luther Burbank - This famed horticulturist is responsible for over 800 plants including 200 fruit/vegetale/nut varieties. The spot is a National Horticultural Landmark. Tours Daily. Quarryhill Botanical Garden - One of the pre-eminent Asian botanical gardens globally, featuring one of the largest collections of documented, wild-collected Asian plants in the world. Peggy Sue's All-American Cruise - A 4-day event the 2nd weekend of June. 800 classic American Cars and Hot Rods pre-1975. Friday Chilli Cook-Off Wine/Beer Tasting, Sat and Sun cars displayed all day. Sat night Downtown Cruise in Santa Rosa. Huge event and a can't miss for the car buff. Vertex is conveniently located in the same industrial complex as Donelan Wines, Salinia, The NPA, Carol Shelton, Vinoteca Collective if you get my drift. Train Town Sonoma - Got kids! Or are you just a kid at heart. Last edited by Brian Tuite on November 29th, 2018, 5:37 am, edited 200 times in total. Well done Brian, very useful. is it possible to get a list of good/popular wineries that are open for visit - categorized by the regions above? maybe separate by public / appt only (true appt only not appt only if you know the pope). Mark Y wrote: this is awesome.. thanks! I DO have a day job. Perhaps I can update the OP as we go along based on input from the group. The new Moon Mountain AVA is not pictured, but if you can picture that Hwy 12 runs up the middle of Sonoma Valley, Moon Mountain is opposite the valley from Sonoma Mountain AVA. 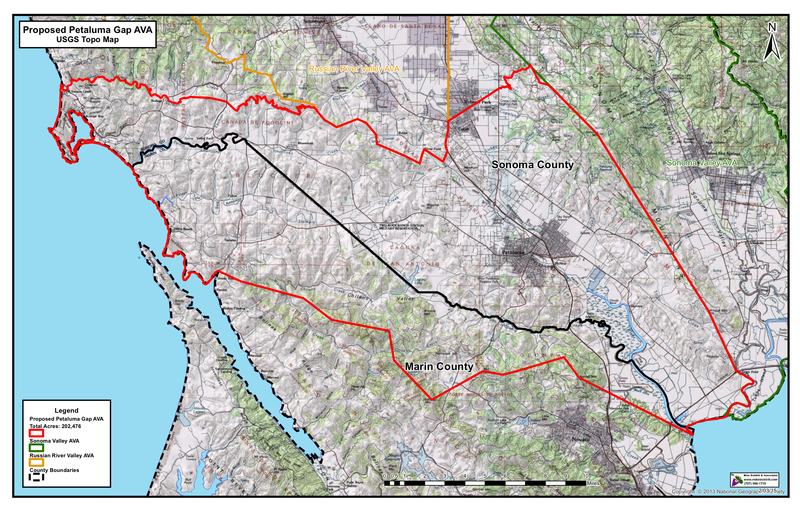 The often talked about "Petaluma Gap" area is the bottom part of the wedge that is currently Sonoma Coast. On the topographical map above you can see "the gap" in the hills starting at Bodega Bay which funnels high wind, cold air, and fog from the coast into the Petaluma area. from the thread title I had hoped it was a lunch invitation. >> Don’t plan to ‘drop by for lunch’ at Russian River Brewing – unless you plan on doing so when the doors open at 11am. The place is typically standing room only with an hour wait for a table any time after noon. >> Unless you own a helicopter, lunch at Girl and the Fig followed by a 1pm appointment to taste your favorite Pinot in the RRV is simply not possible. >> If you would like to visit Guerneville with the kids, don’t do so during Bear Weekend... Google is your friend. M. Sai wrote: >> Unless you own a helicopter, lunch at Girl and the Fig followed by a 1pm appointment to taste your favorite Pinot in the RRV is simply not possible. Good advice! Now i can keep that 1pm schedule, just gotta make sure my chopper is fueled and ready. Yes, the open field in front of General Vallejo's Home is the closest place to land! M. Sai wrote: >> If you would like to visit Guerneville with the kids, don’t do so during Bear Weekend... Google is your friend. M. Sai wrote: Yes, the open field in front of General Vallejo's Home is the closest place to land! Last edited by Paul Luckin on April 22nd, 2014, 7:58 pm, edited 3 times in total. Driving times, example: Sbragia in the north end of Dry Creek Vly to Gloria Ferrer outside of (the town of) Sonoma = about 1 hr 15 m on a busy day. Brian, you're taking on a hell of a project including wineries in your post (and you forgot my must stop Joseph Swan!). A suggestion would be to include some regional web sites. My favorite when anyone asks me for recommendations is to visit http://www.wineroad.com/. This site will give you tons of info on wineries of the RRV, DCV, Alexander Valley and Chalk Hill. http://www.carneroswineries.org/ Includes wineries in both Sonoma and Napa. http://www.westsonomacoast.com/ True Sonoma coast wineries. http://www.wdcv.com/ Wine Growers of Dry Creek Valley. Passport last weekend of April! I'm sure there are some I'm forgetting but other will chime in. Sean Devaney wrote: Brian, you're taking on a hell of a project including wineries in your post (and you forgot my must stop Joseph Swan!). A suggestion would be to include some regional web sites. My favorite when anyone asks me for recommendations is to visit http://www.wineroad.com/. This site will give you tons of info on wineries of the RRV, DCV, Alexander Valley and Chalk Hill. Thanks Sean, it's a work in progress and not even anywhere close to being completed. Swan is on my short list. I was working my way down Olivet Lane towards River Rd and got sidetracked. My wife and I might do a Sonoma tour next year sometime. This thread will certainly help. Are we making a list of all wineries, or a list of recommended wineries? I'm looking at the list of Sonoma Valley tasting rooms, and can't help but think that this doesn't answer the question of: "I'm visiting Sonoma Valley, what wineries should I visit?" Maybe break down by geographical location of the tasting room, with some comments on varietal specialization, AVAs from which they pull grapes, and general style? It was starting out as just that but when Paul dumped his list of Sonoma Valley Wineries on me I thought about it. Just as everyone cannot afford The French Laundry, tastes in wine vary greatly and not everyone here agrees on every recommendation. Therefor I conceded and decided to compile a list that is more complete. Right now I am trying to break down by AVA and then geographically by town, district, street so that folks can plan tastings in a particular area. My current listings are showing tasting room locations if the room is in another location than the winery itself. I will eventually link back to the winery website so folks have all the info. Perhaps they have a free day without a car and need to stay in a restricted area. This might help. I welcome Berserkers to add their thoughts on their favorites, either via this thread or PM, and I will then add the notes to each Winery listing. This is a big task that will take time to morph but i think it could be valuable moving forward. Last edited by Brian Tuite on March 27th, 2014, 8:46 am, edited 2 times in total. Awesome, Brian. Very useful information. Thanks for putting this together. In order to shrink the size of the OP what do you think about me putting the winery listings in a spoiler alert format under each AVA heading? That way people can expand an area if they want but not have to scroll through it if not. Thoughts? Sonoma is a very special place, very different to visit than Napa. Great thread! M. Dildine wrote: Sonoma is a very special place, and an infinitely better place to visit than Napa. Great thread! I understand Brian, but people can pull a list of wineries from all kinds of resources. We have a focused group here that are probably looking for a geekier experience, no? OTOH "recommending" wineries can be a dicey proposition so the list has to be inclusive i.e. We don't want to get into the business of judging a winery to be not worthy. Maybe there's a middle ground where we can provide additional info on a winery, in terms of style of wine, and the more "berserker approved" the winery is, the more info they'll have? Them: "I'm hitting Sonoma, what wineries should I visit?" Us: "Sonoma is a big place, where will you be?" Them: "Not sure." or "I'll be at ABC for a day and XYX for two more." Us: "What kind of wines do you like?" ...so, I guess the list should be large and inclusive, but allow someone to drill down to specifics if they have answers to those two questions. Also, and this is perhaps a daunting task for a thread (better suited for a wiki article?) but I think we eventually expand to include other activities like food, hiking, kid-friendly activities, etc. Awesome post/thread Brian! This is indeed an undertaking and timely for me. I am in the midst of planning a trip with another couple over Memorial Day weekend and have been building our agenda without this great reference. One thing we considered in mapping out our days there was the varietal focus of each, so when we pulled together the producer list we wanted to visit we wanted some variation, but also to start with lighter varietals, ending with the heavier so as to not crush our palettes by late afternoon. To that end, it might be useful to add after each producer some indicator of what they are "known for" or focus on. For example, we will visit Ridge (zin, cab) later in the day and MacPhail (pinot) earlier in the day with maybe Copain (pinot, syrah) in between. Obviously, driving times are important and your breakdown of specific areas will help greatly in that (do wish there were people to hire by the day to drive us, though) - maybe that's another thread. Thanks for the input Chris! Moving forward I'd like to incorporate all of your suggestions. thanks for this. We stayed in Guerneville-a funky place. Interesting that the pot store is next to the brewery-your choice of buzz. I think it would be useful to board members to list members that are in the business (ITB). ie Mike Carlisle (Carlisle), John Holdredge (Holdredge), and Craig Haserot (Sojourn). Visiting with winemakers that are members here is a lot of fun. Sojourn in Sonoma (on the square). I understand that some areas of the "true" Sonoma Coast are difficult or time consuming to visit. Hirsch Vineyards is one that comes to mind. Once there, however, it is supposed to be incredibly beautiful. (Plus for me, being a fan of Hirsch wines, it may be worth the time needed in order to visit). Any suggestions on those "difficult to reach" areas of the Sonoma Coast or, as Yankees might sometimes say, "Can't get there from here." T. Melloni wrote: I understand that some areas of the "true" Sonoma Coast are difficult or time consuming to visit. Hirsch Vineyards is one that comes to mind. Once there, however, it is supposed to be incredibly beautiful. (Plus for me, being a fan of Hirsch wines, it may be worth the time needed in order to visit). It is. If you go, make it the only place you schedule to visit that day. The property is naturally stunning and the wines are spectacular. Ross Cobb is doing amazing things there. You may have time left to able to hit some places on your way back to where you are staying, but leave it open. I bow down to your superior knowledge and organizational skills. Thanks. I do enjoy the estate wines, as well as what WS and Littorai do with their fruit. Haven't yet had a Siduri-Hirsch though. Since it is a bit of a drive, just trying to get a sense of whether it is worth the effort. Thanks for the input. I took my teenage daughters ziplining this past Monday, and we had a blast. The place is "in the middle of nowhere" aka Occidental, and is tucked away. The course offers 7 zipline tracks, with the highest 200 feet up, and the longest is 800 feet. There were 7 of us in the party and had 2 guides with us. One guide went first, and the other last. They take care in making sure you are secured, and were very friendly, helpful and fun. The trip takes exactly 2.5 hours to complete. I highly recommend this experience. Dave McIsaac wrote: I took my teenage daughters ziplining this past Monday, and we had a blast. The place is "in the middle of nowhere" aka Occidental, and is tucked away. The course offers 7 zipline tracks, with the highest 200 feet up, and the longest is 800 feet. There were 7 of us in the party and had 2 guides with us. One guide went first, and the other last. They take care in making sure you are secured, and were very friendly, helpful and fun. The trip takes exactly 2.5 hours to complete. I highly recommend this experience. Great stuff (mentioned it in the OP ), this is the kind of feedback that goes along way towards making this a valuable thread. Thanks for sharing! If you head north, don't miss a chance to head up the coast. We left from Sebastapol, went straight to the coast then north. It was a bright, clear day and the drive was spectacular. Our destination was Peay. We had a wonderful visit. Peay wines are surpurb. It was a whole day ... Up and back and could have included some other wineries (Hirsch) or been a stopover on the way to the way up Sonoma Coast. FYI MacPhail is relocating their tasting room from Healdsburg to Sebastapol in May/June '14. They will now be at 6761 McKinley St., Sebastopol, CA 94572. Primarily a pinot producer with maybe one Chardonnay. Chris D wrote: FYI MacPhail is relocating their tasting room from Healdsburg to Sebastopol in May/June '14. They will now be at "The Barlow" 6761 McKinley St., Sebastopol, CA 94572. Primarily a Pinot producer with maybe one Chardonnay. A lot of wineries are moving their production and/or tasting rooms there as the site popularity increases. Added Dry Creek Valley wineries today. Let me know if I missed any. A quick look at your list for DCV and I don't see Pedroncelli. You also list Frick as Alexander Valley but they are in DCV. Sean Devaney wrote: A quick look at your list for DCV and I don't see Pedroncelli. You also list Frick as Alexander Valley but they are in DCV. Pedroncelli is listed on Canyon Rd, first entry under the Dry Creek heading. That's where I moved Frick to as well. Thanks! Want to add footnotes to wine styles for each producer. If anyone wants to help out with that shoot me your suggestions via PM or in the thread. Starting to add restaurants, that will take a while but it's a start. Needed a break from winery entries. Hotels and Inns to come. If you have preferred transportation services such as wine drivers let me know and I can add those under a sub-heading as well. Also thinking of a Berserker Rating system of 1-5 stars or berserkers that can be added to each listing. What do you all think of that idea? This is going to take forever but it should be good when it's done. For reasons I'll explain below, I felt compelled to play around with the Google Map Engine (Lite) today. My original thought ran into a brick wall, so I figured I'd take all the hard work Brian has put into this thread, and incorporate it into a map, both to satisfy my curiosity, and perhaps "pay it back" a bit. Brian's work on this thread deserves a "Thread of the Year" nomination. I've basically taken Brian's data (he's done the heavy lifting) and entered it into the Google map engine. One of the benefits is that Google attaches, for most wineries, addresses, websites and phone numbers. As I got further through Brian's list, I also slowed down and started to xref the websites to confirm hours and such. Which is my excuse for only getting through "Glen Ellen" for the time being. A note to anyone who uses this a few months down the road - check the winery's website and/or call. While it doesn't happen often, I did note a few changes in schedules and such. I think the map itself is relatively self explanatory. Should work on both laptop and mobile, but the mobile looks kluggy for me with the left panel (which I can't figure out how to hide). I started a separate project today with Google Map Engine Lite, and ran into a huge fail. I wanted to start a collaborative map among Berserkers to map favorite wine retailers around the world, so that as we travel, we could have a handy, ready-to-go reference. A map where each of us could enter our favorite retailers from our home towns or places we've visited. I've used things like Yelp in the past, and politely don't trust most retailer reviews that are available through that kind of forum. The folks here, who frankly buy a lot of wine, have the opinions I value. But anyway, that didn't work. Apparently Google isn't that far along in offering map collaboration, at least not without their costly enterprise version, which is a show-stopper for what I wanted to do. Brian, thanks for all the hard work. A great resource for any visitor. My son is going to Sonoma with a group of friends next month and was happy to have some choices. Dude you killed it! I had something like this envisioned when I started this. Thanks so much for the effort. With your permission I'd like to link the map to the OP. Maybe when we are finished with this thing Todd can pin it to the top of the forum listing as a PSA of sorts.